At sunset I found my great-great-great-great-great grandfather. His wife lived 13 more years… how many times did she stand on this very spot, touching his headstone, remembering, before being set by his side forever? Two centuries later I found them, resting in the place named after him. “Highland Alex” McNaughton came from the Scottish Highlands to Pennsylvania, married the Irishwoman Jennet Watson. Of their five sons and two daughters, three may still be found with them in Helen Furnace Cemetery, Highland Township, Clarion County Pennsylvania. 1. 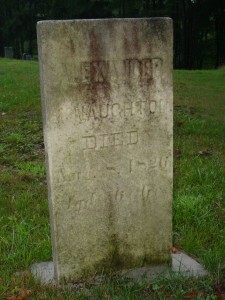 Alexander McNaughton was born 1750 in Scotland, died 8 Aug 1826 in Helen Furnace, Clarion, PA. He married Jennet Watson, born 1760 in Ireland, died 27 Apr 1839 in Helen Furnace, Clarion, PA.
2. John McNaughton was born 1794 in Bald Eagle, Centre, PA, died 1873. He married Elizabeth Brenneman, born 1800, died 1856. 3. Margaret Ann McNaughton was born 1834 in Helen Furnace, Highland Township, Clarion, PA, died 13 Sep 1913. She married John Agnew Jr., born 20 Jan 1832, Red Bank-Ven (? ), PA, died 1922. 4. Bartley Allen Agnew was born 18 Jun 1856, Homing Ridge, Clarion, PA, died 24 May 1916, Kahletown, Eldred Township, Jefferson, PA. He married Leona M. Allen, born 6 Jan 1857, Clarion County, PA, died 25 Apr 1943, Kahletown, Eldred Township, Jefferson, PA.
5. Audrey E. Agnew was born November 1886. She was unmarried at the time of her first child. Her parents forbid her to marry the father, however, they promised to see to it that the daughter was educated. She was; the daughter was a nurse prior to her marriage. 6. Esther Eva Agnew was born 11 Feb 1907 at the Agnew farm near Stattonville, Fisher, PA, died 20 Aug 1999, Monrovia, Los Angeles, CA. I have a “Certificate of No Certificate” from the State of Pennsylvania, indicating the birth was never officially recorded. She married the Rev. Dr. John Davis Barnard, born 18 Sep 1906 in Plumville, Indiana, PA, died 28 Oct 1968 in Arcadia, Los Angeles, CA. 7. Eugene Chester Barnard was born 25 Apr 1931 on the Aber farm (?) near Wooster, Wayne, OH, died 10 Oct 1981 in Olympia, Thurston, WA. He married Beverly Pearl Dierlam, born 23 Sep 1932, Arcadia, Los Angeles, CA, died 17 Dec 1994, Boston Harbor, Thurston, WA. 8. I am the son of Gene and Beverly Barnard.